MOSCOW — The first foreign outpost of California’s slapdash secessionist movement, Yes California, opened here on Sunday. Housed in a research institute in northwestern Moscow, the offices are described as an “embassy” by the group’s founder and president, Louis Marinelli, a stocky, unassuming 30-year-old with grey-flecked hair. Marinelli denies receiving support from the Kremlin, but the opening of his group’s “embassy” raises broader questions concerning Russia’s growing and diffuse influence on the politics of Western countries. Over the past few years, as its relations with Europe and the United States have frayed, Russia has been linked to various radical parties and separatist groups with the apparent aim of sowing disunity among its rivals. Efforts that now face intensified scrutiny amid the fallout of U.S. intelligence finding Russian interference in the U.S. presidential election. Yes California’s founder Louis Marinelli and Anti-Globalist Movement president Alexander Ionov answer questions during Yes California’s “embassy” opening in Moscow, Russia on Dec. 18. Marinelli is campaigning to hold a “Calexit” referendum in 2019. If it succeeds (highly unlikely) and California secedes from the United States, Marinelli says, the former 31st state will apply to become a member country of the United Nations — and in so doing, it will need Russia’s security council vote for admittance. Yes California has garnered support from the Anti-Globalist Movement of Russia, a group that promotes separatist causes in other countries and has ties to the Kremlin, and received office space for its “embassy” from the group after Marinelli attended its separatist conference in September. But the Anti-Globalist Movement maintained that the government had “not given a ruble” toward the embassy opening. The Anti-Globalist Movement of Russia is a good example of the ways Moscow maintains its many murky links with far-right and far-left groups across Europe and the United States. The group has received state financing to hold its conferences with foreign separatist movements like Yes California, and figures close to the government have been in attendance. In 2015 a state civic chamber member and a leader of the far-right Rodina party was spotted among the conference attendees. Independence movements within Russia, however, aren’t met with the same enthusiasm. Several members of such groups have been prosecuted under a harsh anti-separatism law that was passed in 2014. Foreign secessionist groups can play into the Kremlin’s hands both at home and abroad. In Russia, they offer state media a chance to show domestic audiences that the “U.S. is falling apart,” said Alexey Kovalev, a former RIA Novosti employee who now runs a website focused on debunking propaganda. RT and Life were the only national media to attend the opening of the Yes California office space. One is state run; the other is a tabloid with close ties to the Kremlin. But fringe groups can also serve as an instrument to create friction within Russia’s rivals. 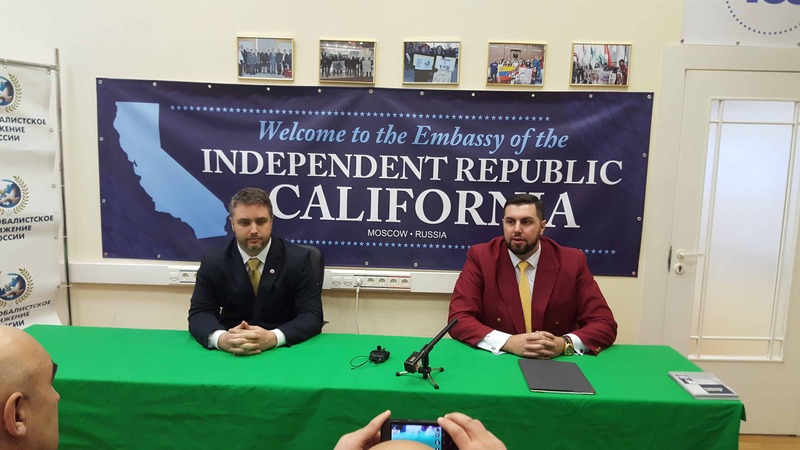 While the Yes California embassy might look like little more than an amusing PR stunt, more influential foreign groups and political parties have received financial and political backing from the Kremlin and allied organizations. On Monday, for instance, Austria’s far-right, anti-immigrant Freedom Party signed a “working agreement” in Moscow with the ruling United Russia party. Anti-Globalist Movement president Alexander Ionov denied Russia was promoting separatists to create discord in the West. He said the Texas Nationalist Movement and Yes California themselves expressed interest in opening up an embassy after coming to his 2015 and 2016 separatist conferences, respectively. “Where could you find a single Russian official who would say California or Texas should be independent?” Ionov asked. Indeed, it’s not an issue often discussed in parliament here. But while Moscow may not explicitly broadcast its support, it has quietly amassed contacts among fringe parties and separatist movements throughout Western countries, while also expanding state media outlets RT and Sputnik, which regularly host Western activists from the far right and far left. Taken together, these operations point to a diffuse and growing network of influence in Europe and the United States. In 2014, France’s far-right National Front party borrowed $11 million from the First Czech-Russian Bank in Moscow, the owner of which is a longtime partner of Russian President Vladimir Putin’s friend Gennady Timchenko. An administration official had previously discussed how to thank the French party for supporting the annexation of Crimea, according to text messages leaked by Russian hackers from Anonymous International. The party’s leader, Marine Le Pen, has met with top officials in Moscow — and the party asked Russia for a $30 million loan earlier this year. EU leaders have taken notice of Russia’s links to European fringe parties. Earlier this year, the German government ordered its intelligence agencies to investigate whether populist parties such as Alternative for Germany (AfD) have similarly been funded by the Kremlin. In 2015, the Rodina party organized the first International Conservative Forum in St. Petersburg, inviting members of European groups widely labeled as white supremacists and neo-Nazis, like the Party of the Swedes, the National Democratic Party of Germany and Greece’s Golden Dawn. American white supremacists were also in attendance, including a lawyer for the Klu Klux Klan, as was a member of Russia’s parliament, Alexei Zhuravlyov. Incidentally, one of the speakers, British far-right activist and noted Putin admirer James Dowson, went on to set up pro-Trump fake news and meme websites during the U.S. election. Moscow doesn’t just focus on courting right-wing parties however; separatist groups, many of them left-wing, like Yes California, also find an audience here. Ionov’s Anti-Globalist Movement, for example, has organized two “Dialogue of Nations” conferences featuring separatists from places including Hawaii, Puerto Rico, Ireland, and Spain. Financing for both events came from the National Charity Fund, a trust founded by Putin in 1999 that gathers money from state-owned companies and oligarchs. And Ionov himself has good connections: he sits on the board of the Antimaidan, a pro-Kremlin group led by member of parliament Dmitry Sablin and Alexander Zaldostanov, a friend of Putin. A letter from Putin thanking Ionov for his “work to strengthen friendship between peoples” hangs on the wall inside the Anti-Globalist Movement offices. Despite his relation with the Anti-Globalist Movement, Marinelli denied Yes California was becoming a Kremlin tool, and maintained his position wasn’t entirely unique, at one point even arguing that American revolutionaries once received outside assistance from France. But in light of recent U.S. intelligence findings of Russian interference in the U.S. presidential election, the timing and location of his first international office evinces either unremitting naïveté or deep cynicism. Martinelli said he is skeptical of Russian involvement in the U.S. election, arguing that U.S. intelligence agencies have misled the public before. The would-be secessionist was born in Buffalo and moved to California as an adult. He says he started Yes California after the Scottish independence referendum narrowly failed in 2014. He has been coming to Russia for teaching stints since 2006 and recently relocated from San Diego to Yekaterinburg, Russia’s fourth largest city about 900 miles east of Moscow, with his Russian wife to teach English for the academic year. He said he plans to go back to California this winter and again in the summer to help with local campaigning but will eventually hand off leadership to Ruiz Evans. “The division in the United States exists without the support of Russia,” Marinelli said. Ionov said the question of independence was one that would be answered by the people of California.